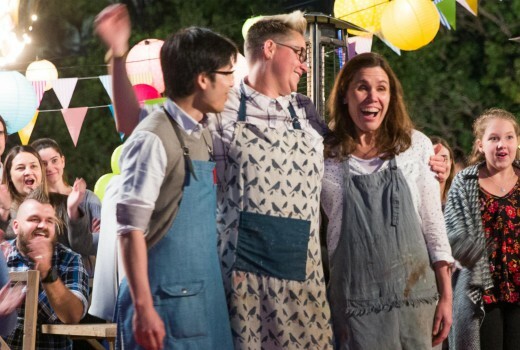 Claudia Anton (pictured, front right) last night was named Australia’s Best Amateur Baker in The Great Australian Bake Off by judges Matt Moran and Maggie Beer. The 48-year-old psychiatrist from Melbourne defeated Dave Yan, 35 from Sydney, and Barb Dunn, 37 from Brisbane. Her final Showstopper was an extravagant ‘Piece Montee’ – a cockatoo shaped from lemon myrtle and vanilla choux pastry buns complete with a pulled sugar crest. Very Oz. “I will be forever grateful for this wonderful show that embraces individuals of all personalities and walks of life and fosters their baking passion in a truly beautiful way. Bake Off has been life changing for me, and has taught me to follow my passion, face my fears, challenge myself and take a chance,” she said. There is no cash prize for winning Bake Off but Claudia’s cheesecake recipe will be featured in Delicious magazine’s April 2018 issue. Hosted by comedians Claire Hooper and Mel Buttle, the finale drew 162,000 viewers Overnight. Foxtel says the third season has been the most successful season to date, positioning it well for a probable renewal. I will however, highlight that even in the finale, we got a brief 30 second to a minute recap of the three bakers’ journey over the entire season… That’s right… less than a minute recap for each. Which is in complete stark contrast to the bloated, over the top finales of the bigger commercial network competition shows (not just cooking ones either… and yes I understand advertising revenue and being bigger in general etc. but alas…). It also came in at an hour… not 2 and a half plus hours of padding. Tighter, more succinct shows should be seriously considered all around imo. Congratulations again to everyone for this awesome Aussie production. It’s been a very good season and I like that they continue to stay true to the original UK version. I’d hate to see this morph into any one of the FTA cooking shows with fake drama and fighting contestants. During the commercials they’ve been advertising that applications are open for next season, so while they may not have officially announced it, it appears it’s on the cards. I expect it might not air until 2019 though, as this season was originally planned to air in 2017 but for some unknown reason was delayed to 2018.